smartphenom.com: Internal LG memo indicates Android and QuickMemo updates coming - Jelly Bean anyone? Internal LG memo indicates Android and QuickMemo updates coming - Jelly Bean anyone? 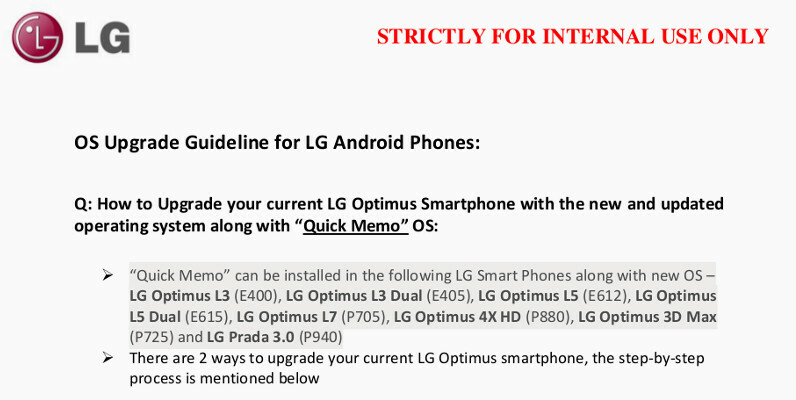 An internal document by LG dated August the 15th, 2012 suggests that OS and QuickMemo updates are on its way for their latest Android handsets. The document is probably part of an approval workflow that will end in the Q&A section of their customer support site. I'm not reproducing the entire document in this post but it basically describes the procedure to get the handsets updated, either through a PC or over the air (FOTA). As soon as we gather further details we'll provide an update. Stay tuned.